» The city’s largest borough currently suffers from a large gap in service, but relatively inexpensive improvements could address those problems well. Though New Yorkers overall are used to some of the longest commute times in the country, residents of southeast Queens are particularly affected. The inhabitants of this large segment of the borough between JFK Airport and Jamaica, from Brooklyn to the city line, have average travel times to work of more than 50 minutes. That’s each way. It’s a terrible situation, especially since so many people in the pretty dense neighborhood rely on public transportation to get around — and so many are headed to Midtown and downtown Manhattan, areas with high levels of train and bus service already. Transit planners have a moral obligation to find ways to improve their commutes, even in face of the mounting budget deficit currently pounding New York’s Metropolitan Transportation Authority. Fortunately, there are several cheap investments the city could make that would substantially reduce the trip times of those living in this part of the borough, starting with a change in fare policy. Leveraging existing transit corridors to a fuller extent by constructing more stations in southeast Queens is also a serious and relatively inexpensive option. New York offers a standard ticket price for its subway and bus services; the same fare is paid for trips consisting of just a few blocks or twenty miles. The same applies for the city’s unlimited passes, which allow rides anywhere in the city on buses and subways for a set price over a period of time. There are positives and negatives associated with this system — one thing it certainly does is instill the idea that the whole city is accessible to every citizen, of any class — but it certainly preferences people who live far from their jobs. Yet New York City is structured in a way that makes further densification of the central city core very difficult, even as most jobs continue to be located in Manhattan; people from the outskirts of the city, like it or not, need to be able to get to the center in a reasonably short period of time. That single-fare policy has not been extended to the MTA’s commuter rail systems, Metro-North and the Long Island Railroad, both of which provide quick access from the outer boroughs to parts of the Manhattan office districts, at a higher price. From Jamaica, at the northwest tip of Queens’ southeast quadrant, a ride to Penn Station on the LIRR takes 19 minutes and costs $7.60 at peak times (or $5.46 during off-peak times); on the E Express Subway (faster than most), the trip requires 34 minutes, for $2.25 (or about $1.50 using an unlimited pass). For many commuters, there’s a difficult choice to make: pay more than twice as much and get a 45% faster ride, or save money and squeeze into buses and subways. Most choose the latter option because it’s cheaper — which explains the high average commute times for people from Southeast Queens in spite of the large number of transit lines that criss-cross the area. It also explains the under-use of some of the existing branches of the LIRR in southeast Queens, including the Far Rockaway Branch, which stops at Locust Manor and Laurelton Stations; the Hempstead branch, which includes stations at Queens Village and Hollis; and the West Hempstead branch, with its stop at St. Albans. Thus an easy fix for this problem would be to make in-city trips on the commuter railroads the same price as those on the subway and buses, and allow commuters to make free transfers between the two. This would instantly reduce typical travel times for people in this section of Queens (and areas of the northern Bronx) and increase the use of the existing commuter rail capacity on the three LIRR corridors mentioned above. If the city subsidized this fare reduction, the state-financed MTA could continue charging current fares on trips coming from outside of the city without encouraging debate over differences in transit provisions for the city and its suburbs, a discussion already at the heart of many of the agency’s financial problems. Creating fare equity between the commuter railroads and the subways would produce significant time savings for the residents of southeast Queens. But the introduction of more people onto the LIRR system would require some substantial changes in commuter rail operations in order for the services to remain reliable. For one, in-city stations benefiting from reduced fares would have to have turnstiles installed so that free transfers could be enforced. Or, the MTA could wait for the universal contactless farecard it is already developing, a ticket designed to allow conductors on the commuter trains to make pass inspections using the same system as installed at subway faregates. The introduction of thousands of new daily riders on LIRR trains would likely cause some capacity problems, since many of the system’s trains are already overcrowded at rush hour. Some of the difficulties would be solved with the opening of East Side Access to Grand Central Terminal in 2016, which will allow a larger number of trains to enter Manhattan. Moreover, with increasing ridership likely to occur anyway, the railroad will have to buy more trains over the next decade; if these vehicles were configured more like rapid transit, with more doors and more standing room (unlike existing LIRR trains, which prioritize comfortable seating), the larger number of riders could be handled easily. And of course, there’s another easy way to relieve capacity issues at Penn Station: simply run trains through from New Jersey to Long Island, reducing track use in the central segments of the system. It can be done. Though the MTA would lose revenue by significantly reducing the cost of inner-city commuter rail trips, it would likely also increase transit ridership on trips coming from areas at the edges of the metropolis. Meanwhile, the changes I’ve suggested would require limited investment above and beyond what was already planned — the new contactless farecard is being designed already; new trains are to be ordered within a few years anyway, and a change in their design won’t affect their pricetag. But there are other, more costly investments that would focus on the commuting problems of this particularly isolated neighborhood. By adding stations to the three branches of the LIRR that pass through the community, a far larger slice of the population would suddenly find itself within half a mile of a rail station. Though adding a stop or two for each line would slightly increase the commute times of people coming from further away, they would significantly reduce the trip times of people in this neighborhood by providing quick, direct access to Midtown Manhattan and connections further down the line to subway routes heading throughout the city. Building a new station is not exactly a cheap proposition, but taking advantage of an existing rail line, rather than, say, extending a subway (something that’s been proposed for Southeast Queens in the past), is a much less expensive alternative. And then there’s AirTrain JFK. Since it opened in December 2003, the line has become an important tool for commuters getting to and from JFK Airport; it connects each of the airport’s terminals directly to LIRR and subway services (E, J, and Z trains) at Jamaica, and to A Subway services at Howard Beach. Elevated above the median of the Van Wyck Expressway, its route passes directly adjacent to some of the neighborhoods that suffer from exactly the long commutes that irritate so many people who live in southeast Queens. Unfortunately, because the AirTrain was built with funds from the federal government’s Aviation Trust Fund and airport Passenger Facility Charge revenues, it could not include local stations — the only stops on the line are at airport terminals, passenger facilities, and at the transit drop-offs at Howard Beach and Jamaica. Federal regulations state that those revenue sources can only be used for a project that “must exclusively serve airport traffic.” This results in a number of peculiar situations that ultimately reduce the effectiveness of transit that serves airports in the United States, since through-running and local (non-airport) stops are basically banned by the Federal Aviation Administration. Theoretically, several new stations could be added to AirTrain along the Van Wyck corridor without reducing existing capacity by creating side-platform stations and building access tracks separate from the express tracks used by JFK-Jamaica trains. This would be a pricey investment, since it would require the creation of a new track connection between Howard Beach and Jamaica trains (to avoid interrupting airport express and inter-terminal service) and it would require the construction of a series of elevated platforms above a freeway and connected to an in-use transit line. Faregates would also have to be installed at JFK terminals to ensure that passengers pay the correct charge, since those riding on the new Howard Beach-Jamaica train would pay standard subway fares, while those heading for the airport would continue to pay the $5 airport fee. These improvements would provide direct operations from a number of isolated neighborhoods to Jamaica and Howard Beach, from which there would be easy transfers to Midtown and Downtown Manhattan-bound trains. It would have been more convenient to make these changes when the project was first being built, to say the least. But these changes wouldn’t affect the quality of the original investment and therefore would not pose an affront to FAA regulations. Sadly, the MTA has done very little to address the excessive commute times of southeast Queens residents, who deserve improved transportation access, and there has been no coordinated planning for better transit service for the neighborhood. Its denizens are likely to see long trip times for decades to come. Yonah, when you write, “leveraging existing transit corridors to a fuller extent by constructing more stations in southeast Queens…,” do you mean to extend the J/Z and/or E Train to the St. Albans portion of the LIRR’s Montauk Branch? That would help out greatly with the commute times. The LIRR doesn’t need that branch as it can route trains over the Locust Manor section. If I remember correctly, that was to be part of the Archer Avenue project as originally proposed. Another issue, which could be mitigated if the St. Albans section is converted for subway use, is to address the terminal capacity for the E Train at Parsons/Archer. It turns 12tph, but the E runs at 15tph and needs to turn some trains at Hillside. The E and F get to capacity very fast on their way to Manhattan. My understanding is that 71st St station has issues that effect its terminal capacity for the local lines. I’ve been told that this is why only 20tph of R and V trains are turned there. If this is correct, and if it is rectified, then 30tph of local trains would be able to turn there. More frequent local service should attract more riders from the F and E, which would cut down on dwell time issues as these trains head into Manhattan. The J/Z would be able to attract more riders from the E if the ride on its 19th century alignment wasn’t so slow. Fixing this, while not necessarily cheap, should help the E, as well as the commute times of existing J/Z passengers. The AirTrain idea is interesting. I’m not sure how much it would help because it would load more commuters to packed E Trains without adding capacity to Manhattan. The idea to make the LIRR more attractive has a lot of merit. It does offer more capacity. What does concern me is that LIRR trains are much more expensive to opeate than subway trains. Should the city really subsidize the very expensive labor costs of those trains when it isn’t even subsidizing the subway to the extent that it should? 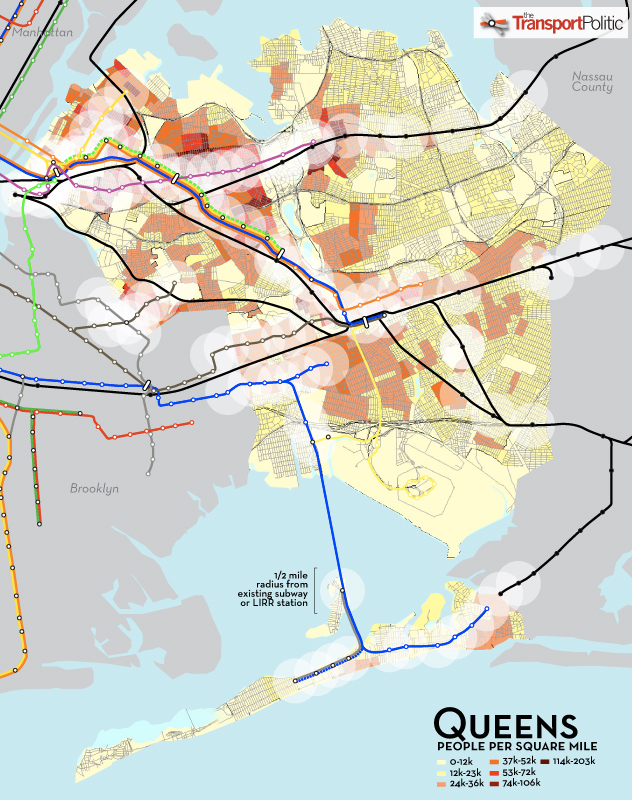 As I see it, the capacity to SE Queens really needs to be addressed before connectivity is improved. This can either be done by building new lines into SE Queens, or by constructing new lines in other parts of Queens that attract commuters from the E and F, which would restore some capacity to those lines. I don’t see this happening any time soon, unless the Federal Government steps up. One possible new line could be a subway line over the LIE from the city border into Manhattan as a 34th St crosstown. This could even link up with the L. A Canarsie to Little Neck Parkway line would be shorter than the A, so it should be operationally realistic. Anyway, this is many billions, and possibly much community opposition, away from reality. Very interesting proposals, and very reasonable. The addition of stops along the Airtrain seems particularly good, but I wonder if they would need larger cars that aren’t just designed for 20 or so people with luggage. I wonder if there is another post you could write if you have a budget of say, $2 billion. I’ve seen the Regional Plan Association’s proposal to connect the Laurelton Branch to the Archer Ave subway, which would be a relatively inexpensive comapred to other MTA capital construction items. Also, would it ever be possible to extende the A Lefferts to Jamaica? I think a potentially cheap and easy way to provide better service to SE Queens would be to run a subway-like shuttle on the LIRR combining the Lower Montauk Brach to LIC and the Laurelton Branch, with the stops you added. It could be implemented before the ESA is complete and would not affect capacity issues on the LIRR as they are now. It would affect the capacity of the 7 train, but if a new station is built to transfer to the M and additional ferry service were provided, that could relieve the 7 at Vernon-Jackson. I thought that in the RPA’s MetroLink proposal, they were going to use that branch for subway service to Atlantic Avenue, with that also converted for subway service, and connected to the Second Avenue Subway. We all long for the days when New York subways could realistically be budgeted at $350 million per two-track mile plus $75 million per station. Nowadays, when MTA Capital Construction is incapable of building stations for less than $500-1,000 million each, there are more important priorities than making multi-branched system maps based on SAS. Alon, we are discussing converting an existing redundant LIRR route to subway standards and connecting it to the E or J trains, not new subway lines and stations. I know, AlexB – I’m just pointing out that the cost projections in the RPA study are way lower than the current reality in New York. For stations, it’s especially brutal. Converting an existing LIRR route to subway standards would be great, as long as the interstations were not as short as on the Rockaway lines. But such projects tend to run into FRA issues, which blow costs out of proportion. How much do stations cost when they are at grade or elevated? Certainly, they must be less than the half billion dollar subway stations. Long past time to make MN/LI services within the five boroughs Metrocard fare erasing the distinction between legacy commuter RRs and rapid transit. Note similarity to the Grey Line proposal for Metra Electric in Chicago. Thus an easy fix for this problem would be to make in-city trips on the commuter railroads the same price as those on the subway and buses, and allow commuters to make free transfers between the two. I actually used to live in Southeastern Queens, and I periodically used the LIRR at the Queens Village station for off-peak trips to Manhattan. Otherwise, I either took the bus which was a perpetual ride to Jamaica or drove to 179th Street on the F.
I’ve been rather supportive of creating fare equity for the commuter rail networks or at least lower priced railway service, but the problem is that the high operating costs of the Long Island Railroad (and Metro-North) make doing so rather hard. If there was significant slack in terms of providing operating subsidies, it may make some sense to do so, but until then, it’s going to difficult to implement which is rather sad given that it’s standard operating practice in other cities around the world. FWIW, have you considered looking into the farebox recovery and labour costs of foreign systems to compare to American networks? I’m tempted to argue that the Europeans charge higher fares and have lower labour costs which allows them some flexibility in terms of operating costs and subsidy provision. The MTA seems to be dragging its feet on the M-9s. Mind you, I’d argue that an LIRR that focuses on the inner suburbs with more frequent service may need a bit more in terms of modifications. For the stations that are being added, there needs an emphasis on a higher acceleration fleet that provides WMATA/BART levels of acceleration, and given the LIRR’s questionable electrification, may require a redesign of the substation network. The Europeans don’t charge higher costs, unless they’re British. The RER is pretty cheap by New York commuter rail standards, and the Berlin S-Bahn is even cheaper. They achieve reasonable cost recovery by not lading each train with multiple conductors; instead, they use faregates, or proof of payment. To add to my previous comment: “pretty cheap” is an understatement. I was looking at NJT fares, which are a little bit more reasonable than LIRR/Metro-North fares. A metro area-wide unlimited monthly on the RER costs €122.10, which works out to $170. On MTA commuter rail, the same $170 will get you from Manhattan to the city line. Just for sampling purposes, one ticket for Berlin’s U-Bahn’s AB zone is 2.10 EUR which is roughly equivalent to $2.80, and a three zone ABC ticket is 2.80 EUR which is equivalent to $3.82. A monthly AB pass is 72.00 EUR which is $98.00, and it’s three zone equivalent is $120. The S-Bahn is cheap by commuter rail standards, but the U-Bahn is expensive compared to NYCTA. And if one looks at the design characteristics of the S-Bahn, they’re more comparable to our WMATA and BART rolling stock, not our commuter rail rolling stock which appears to be more like a regional railway carriage there. The Berlin U-Bahn is pretty expensive, you’re right, but the S-Bahn isn’t. And the S-Bahn is not really comparable to BART – SEPTA Regional Rail is the closest thing the US has to an S-Bahn. An S-Bahn/RER is a regular railroad, run by the national railroad company and connected to the intercity network; it just provides high service levels and has none of the American FRA regulatory nonsense. At any rate, most European subways are cheaper than the Berlin U-Bahn. The monthly fares on major Western European subways that aren’t the London Underground are mostly in the €40-60 range. The Métro charges €55.10 a month, which is also valid on the inner lines of the RER. An S-Bahn/RER is a regular railroad, run by the national railroad company and connected to the intercity network; it just provides high service levels and has none of the American FRA regulatory nonsense. This is not the case of Hamburg and Berlin S-Bahn, they’re separate systems from general rail network. The S-Bahns are run by subsidiaries of DB, and feed into the same train station tracks as the intercity lines. The RER is somewhat different – for one, SNCF only runs half of it. But it’s still connected to the national train network, has the same loading gauge as the national train network, and runs trains on the left just like the national train network. No mention of the failed BRT proposal for Merrick Boulevard? Or the current Jamaica Bus Improvement Study? would love to see the Keystone train travel through NYP to Jamaica at the very least providing through service. Very nice proposal, generally. If you don’t mind my asking: what sort of graphic software do you use to make maps like these? They’re extraordinary. Yeah, I’ve always wondered how you make your maps, they are amazing indeed. Thanks for the compliments, guys! Adobe Illustrator. None of those pesky GIS tools. Yonah, you really did an excellent job with the graphics. Where did you get the data? There needs to be a quicker way to get to Queens college. i agree with harold about needing to get to queens college faster. There’s no use in converting euros to dollars to justify their economy. The comparison should be made to a more regional metric, like percentage of income spent on transportation. Using median income may not be a wholly fair metric, either, but with the exchange always fluctuating, but due to New York’s greater wealth, it’s not as ridiculously expensive as implied. Cameron, you’re comparing apples to oranges. $170 only gets you as far as city line in New York, and does not include the extra fare you’d need to pay to switch to the subway. €122.10 gets you anywhere in Ile de France, and can be used on the Métro as well. €72 gets you only within city limits in Berlin, but a) it’s good for the U-Bahn as well as the S-Bahn and b) Berlin’s city limits are more liberal than New York’s, and include almost the entire S-Bahn network. By the way: where is your median income data for Paris and Berlin for? I’ve been looking for this data for European cities forever. Do you have a link? I’m not doubting – I think both figures make sense – but I’m just curious. All quite laudable, i.e. providing better LIRR service to southeast Queens. But the one thing missing from this picture? We still do not have a one seat ride from JFK to midtown. In this regard why is it that almost everyone forgets the abandoned and still largely intact Rockaway Line of he LIRR, which runs through central Queens north of the present Aquaduct station on the “A” subway line north to a junction with the LIRR four track mainline to Penn Station just east of 63rd Drive in Rego Park. By resurrecting this line a one seat ride between midtown (Penn and, eventually via East side Access, GC) and JFK would finally become a reality, with a running time of about 40 minutes. And there would be several intermediate stops (as there once were) at Ozone Park, Woodhaven, Brooklyn Manor (Jamaica Ave), Parkside (Metropolitan Ave) and 63rd Drive-Rego Park, providing service to neighborhoods along the line, some without any raid rail transit at this time. So too, a connection (at Woodhaven Jct) also exists fro a one seat ride between Brooklyn-Flatbush/Atlantic Aves LIRR station and JFK using the same revived line. I am not sure who these changes are supposed to benefit. I live in the Rockaways further south of the area described here, and commute times to Manhattan are atrocious. It takes me about 53 minutes under ideal conditions (off-peak hours, no trains being held in stations by dispatchers or police, no waiting for the South Channel bridge to close after opening to let boats through etc) for me to get from Beach 67th St (the last stop in the Rockaways on a Manhattan-bound A) to West 4th St. It also takes just about forever to get to Jamaica (often lumped together with the Rockaways as southeast Queens), either going through Manhattan on the F (transferring at Jay St or West 4th St) or taking the Q22 and Q113 buses. The fastest way to get to Jamaica from the Rockaways is by taking the AirTrain, assuming one is willing to pay $10 for the privilege (fare is collected at both entry and exit and is only $5 if getting on or off at a JFK terminal). However, even this is not all the fast, taking about 15 minutes to get to Jamaica from Howard Beach, including a transfer. If a line is built from Howard Beach to Jamaica parallel to the AirTrain, it will still take at least 8 minutes to get from Howard Beach to Jamaica (Sutphin Boulevard). The A train takes 12 minutes to get from Beach 67th to Howard Beach, so the total length of a journey from Beach 67th to Penn Station would be about 40 minutes (12 minutes to Howard Beach, 8 minutes to Jamaica and 20 minutes on the LIRR from Jamaica). Of course, with the two transfers (unless a through train is run from the Rockaways to Jamaica) this will probably be at least 45 minutes. The one seat ride on the A to Penn Station is about 57-58 minutes. Is it really worth building all this new infrastructure to cut a commute by 12 minutes? People going to Lower Manhattan will need to take the subway down from 34th St for another 7-10 minutes, negating the benefits altogether. Also, the line that Robert Kozma mentioned has been repeatedly hyped as a one seat, 40 minute ride from the Rockaways to Penn Station. This too, is kind of pointless. While it will shave about 17 minutes off taking the A to 34th St, there will be no benefit whatsoever to someone going to Lower Manhattan, instead having to transfer to a downtown subway train and losing up to 10 minutes. Not everyone is trying to get to Midtown; however, even Lower Manhattan or Downtown Brooklyn is a hard slog on the subway from anywhere in Southeast Queens. I am not sure a solution really exists. In any case, there is massive NIMBY-ism from the residents along the abandoned LIRR line, and it is highly unlikely to ever be turned into use for the subway/LIRR again, with all indications being it will be used for a Queens version of the High Line. I understand that this article focused on the neighborhoods of Locust Manor, South Ozone Park etc and not the Rockaways, but there are over 120,000 people in the Rockaways that could use better commuting options, and any discussion of transit improvement in SE Queens should take them into account. However, like I said, I am not sure any of the currently floated solutions are any good. Wouldn’t it be awesome if all people movers would be replaced by PRT.